Thirteen-year-old Verity and her older sister Jane are on a schoolgirls' tour of Canada in the summer of 1939. When war is declared the girls are stranded. Most of them return to England in a few months but some, like Verity, have to spend the rest of the war at boarding school. Verity, a spoilt and sulky girl, is horrified. In her diary she complains about school and relates how she bullies one of the girls in her dorm. Eventually, however, she realizes how badly she is behaving and makes amends. 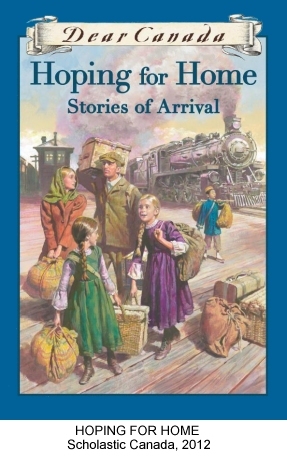 This anthology consists of imaginary journals of girls' and boys' arrivals in Canada at different periods in history. Verity's story is based on fact: her group of touring girls were the first "war guests" - young people whom Canada hosted to be safe during World War II. In their case, however, they did not choose to come to Canada, but were marooned there at the start of the war. Some of them were sent to Bishop Strachan School, which is a real school that both my mother and aunt attended. I used details from my aunt's letters home from school, and I was also inspired by a very helpful interview with Lyn MacMillan, who was one of the marooned girls and who, like Jane, attended the University of Toronto when she could not return to England.